You'll be £6.00 closer to your next £10.00 credit when you purchase The Brontë Sisters. What's this? Jane Eyre, Wuthering Heights, The Tenant of Wildfell Hall...these fictional masterpieces are all recognised as landmarks of English Literature. Still inspirational and challenging to readers today, upon release in the mid-nineteenth century they caused a veritable sensation, chiefly due to their subject matter and unconventional styles. But the greatest sensation of all came when these books were revealed to be the creations of women. This is the story of those women and of the forces that shaped them into trailblazing writers. From early childhood, literature and the world of books held the attention and sparked the fertile imaginations of the emotionally intense and fascinating Bronte siblings. Beset by tragedy, three outlets existed for their grief and their creative talents; they escaped into books, into the wild moorlands surrounding their home and into their own rich inner lives and an intricate play-world born of their collective imaginations. In this new study, Catherine Rayner offers a full and fascinating exploration of the formative years of these bright children, taking us on a journey from their earliest years to their tragically early deaths. The Bronte girls grew into women who were unafraid to write themselves into territories previously only visited by male authors. In addition, they tackled all the taboo subjects of their time; divorce, child abuse, bigamy, domestic violence, class, female depression and mental illness. Nothing was beyond their scope and it is especially for this ability and determination to speak for women, the marginalised and the disadvantaged that they are remembered and celebrated today. This timely release offers a fresh perspective on a fascinating family and a unique trio of talented and trailblazing sisters whose books will doubtless continue to haunt and inspire for generations to come. Beautifully written giving a fascinating insight into the lives of the Bronte sisters. An enjoyable and informative read. I thought I knew a lot about the Brontë sisters but was pleasantly surprised to learn lots of new and interesting facts. Excellent writing. New, interesting and exciting details about the lives of these amazing women by an author who is evidently a complete expert and brings a fresh perspective despite there having been many other books about the Brontes. An addictive read by a talented and thoughtful writer. 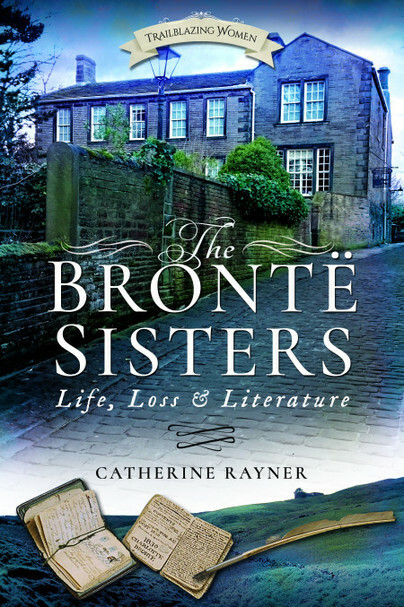 The Bronte Sisters: Life, Loss and Literature by Catherine Rayner gives an overview of the lives of the infamous sisters as well as the lives of their father and beloved brother. This book also examines the societal and cultural world the sisters grew up in, and also how this influenced their literary success. This book definitely brought a new perspective to the hordes of biographies out there on the Brontes. It gave a fascinating insight into their lives as well as the society and culture that they were living in during the Victorian period. I most definitely enjoyed this book and found it a very informative read. The Bronte Sisters: Life, Loss and Literature by Catherine Rayner is a perfect addition to your personal library, especially for anyone who wants to learn more about the Bronte sisters or in fact for anyone who is new to the works of the sisters and want to find out more about them and their life in general. This timely biography by Bronte Society council trustee and life member Catherine Rayner provides fascinating insight into the lives of the trailblazing young Bronte sisters. I appreciated how this brought a new perspective to the hordes of Bronte biographies available. If you enjoy the Brontë works, and want to learn more about their lives and influences, I would definitely check this out. The Brontë Sisters: Life, Loss and Literature published by Pen and Sword under the Trailblazing Women category is written by Catherine Rayner, life member of the Brontë Society and Trustee on the Council of the Brontë Society. As such, she is well placed to access resources and research material. This book contains eight pages of coloured photographs, many familiar but welcome all the same. Rayner has studied and researched the life of the Brontë family for over forty years and her commitment and knowledge are indisputable. I have also been a Brontë ‘fan’ for over forty years. Indeed, my own first foray into dramatic writing was an adaptation of the Brontë juvenilia entitled We Wove A Web in Childhood, in the late 1980s. As I worked my way through their writings and letters I ‘found’ and developed a dramatic journey which sought to show how the childhood experiences impacted upon the adult relationships – something that Rayner’s book also addresses. The two big hitters of Brontë research remain Dr Juliet Barker and Dr Christine Alexander. Rayner acknowledges and draws from both but the clue on her own personal ‘take’ on the Brontë sisters is found in the ‘Trailblazing Women’ banner. She offers a view of the three sisters which is embedded in an exploration of their place in social history and of their mental and emotional states. She uses her own background knowledge of developmental psychology to interpret and suggest, while never becoming dogmatic. Drawing on primary source material, Rayner perhaps privileges letters over the novels and poems, suggesting there is less speculation in the former. Speculation, however, is always present. Letters, after all are partisan and since there is most material in all forms from Charlotte, the danger is always that her views predominate. As a counterbalance, Rayner gives equal weight in her study of each individual novel, contextualising both the work and the author in terms of Victorian society and its contemporary norms. This certainly works to give the reader more insight into the often- overlooked Anne’s works. As in the famous ‘gun’ portrait, where Branwell paints himself out, I feel that he is rather a casualty in this work with its focus on the female experience. I feel there is ground to be made on a deeper examination of the psychological impacts on a lone male child in a largely female household. Rayner suggests little sympathy towards Branwell’s mental state, while pointing out a range of mental and emotional weaknesses in each of the sisters with some empathy. I can’t help but wonder how hard it must have been for Branwell to be brought up in this family. Branwell is most often mediated through Charlotte’s eyes and there is a danger inherent in this. Rayner concords with what I feel is a rather harsh (though common) view that Branwell was simply a talent wasted – and yet she has much more sympathy for the failings, particularly of Charlotte. It serves the purpose of this book, but I feel uncomfortable with the conclusions. Anyone who writes about the Brontës offers their own perspective and interpretation. There is so much that can never be known. The ‘definitive’ work remains Dr Barker’s biography but Rayner certainly opens some interesting windows onto the world with her melding of the social conditions and the emotional and psychological states of her ‘subjects.’ This is not a pure feminist interpretation of the sisters, but it does speak to our time, looking into issues of gender abuse on a societal level. The Brontë sisters may have been ahead of their time in their exploration of the role of women in society, but look today and you see many of the same issues still needing to be addressed both in fiction and in fact. It is a good time for a new book about the Brontë sisters. The Brontë Society are in the middle of a four-year Bicentenary celebration: Charlotte 1816, Branwell 1817, Emily 1818 and Anne 1820. So, a re-evaluation of the siblings is both expected and will serve well for Brontë lovers old and new. I had reservations about the value of another book ‘exploring’ the Brontës, this gave me much food for thought and made me itch to go back and read the novels again – starting with Anne – which shows that Rayner has been an effective advocate for the Brontës. Such a wonderful book and I recommend it. I love the writings of the Bronte sister and this book adds to my interest in the family. I enjoy learning more about writers and what not only inspires them, but leads them to their writings and thoughts. This book is perfect at fueling my desire to learn more. When I saw The Bronte Sisters was up for request on NetGalley, I figured what better way to get into nonfiction than to read about one of my favorite authors, Charlotte Bronte, and her lesser known sisters. The writing style was brilliant and I really enjoyed reading this. What makes a non-fiction book enticing enough to read is largely to do with writing style, for me – I can’t read page after page of dry, boring facts. Rayner writes this in a way that makes it feel like a story, and it made it enjoyable to read despite the repetition. The Bronte sisters were incredible writers. When you really understand their lives and how their childhood shaped them into the women they became, their books become even more fascinating. If you’re at all interested in the Bronte sisters, or you know someone that is, I would highly recommend it. Since Wuthering Heights has been my favorite book since my university days, I was immediately attracted to this book. And, of course, Jane Eyre is deservedly revered. I knew very little beyond the basics of their lives so gaining further insight here was fascinating. It seems quite amazing to me that they were able to succeed as they did given the difficult family,social and cultural times in which they lived. On top of everything else of course there were significant money constraints. Given this milieu, it seems quite incredible not only that they produced such great fiction but they tackled such strong, "indelicate " (for the time) subject matter. The author has produced a very fine book, well-written and insightful. I am sure to reread it. It was very interesting to get a wider context to the lives and works of Charlotte, Emily and Anne, and I enjoyed reading about the enigmatic sisters. The writer succeeds in painting a picture of their lives, their characters and the circumstances in which their works of literature came into being. I am fascinated by the Brontes so am always interested in any new books about them but at times it can feel like everything has already been said. This is an interesting take on the Bronte myths and realities and I really enjoyed reading it. Highly recommended for anyone who loves the Brontes and the novels. The author does a great job of linking all the various strands of novels, reality and family together and it will be a great addition to the Bronte study canon. The author uses an acculturated, fluid, winding, meditative tone to describe the lives, works, and repeated themes (including the Great Glasstown Confederacy) of each of the Brontë sisters. I was lucky enough to get my wish granted by Netgalley and get this fascinating book about the Bronte sisters. Having a thorough understanding about the sisters, their lives, their experiences just made me appreciate their books so much more! This is perfect for those who love the Bronte sisters! Historically vivid, written well. For any one who is a history and literature buff this will be right up their alley. I enjoyed it, having never read much about the Bronte sisters. I liked the authors style of writing and though it was a biography, it read smoothly like a fiction novel. Curious about The Bronte sisters? Looking to read a biography but don't know what to read? This book is an excellent place to start. Much has been written about the Brontë sisters, indeed the family, and this will be a fine addition to them. There are many books and biographies about the Brontë family, and one may wonder if there is anything new to say on the subject. This was an enjoyable read for me, the author doesn't just relay by now well-known biographical facts, but examines the societal and cultural world the sisters grew up in, and how this influenced their literary success. Personally, I don't think I can ever read enough about the lives of these remarkable women. I recommend it to those who approach the complex and fascinating world of an extraordinary family. Catherine Rayner is a Life Member of The Bronte Society, a Trustee on the Council of the Bronte Society and the Chair of its Conference and Publications Committee. She studied at Hull and Leeds Universities and has degrees in English and Philosophy with Social History, Health and Social Care, and an MA in Victorian Literature. She has studied and researched the lives of the Bronte family for over forty years, and has previously written two theses on Emily Bronte, as well as various articles. Alongside this, she is a qualified nurse and has studied the effects of childhood on the development and psychology of adults.